Chelsea moved to within two wins of reclaiming the Premier League title after Eden Hazard’s goal gave them a narrow victory over Manchester United at Stamford Bridge. Hazard’s first-half finish gave Jose Mourinho’s side three points and means that victory in forthcoming games at Arsenal and Leicester City will return the title to Stamford Bridge for the first time since 2010. 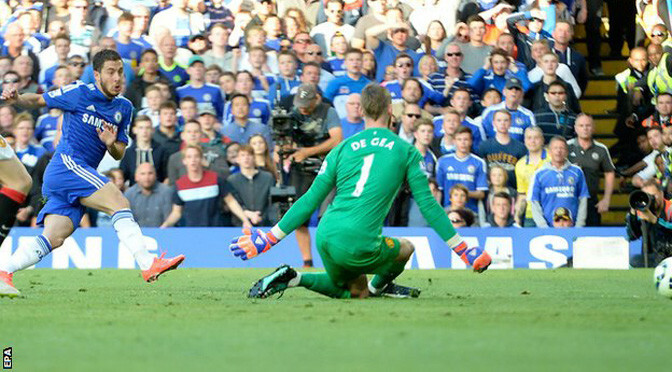 Chelsea were pushed all the way by a resurgent United, hunting a seventh successive Premier League victory. Wayne Rooney and the recalled Radamel Falcao came closest for United but once again they fell victim to the resilience and defensive strength that is Chelsea’s trademark under Mourinho, assisted by the brilliance of Hazard, and ended frustrated. The reaction of Chelsea’s players as referee Mike Dean sounded the final whistle, celebrating wildly in front of their supporters, suggested they believed this was the victory that has pushed them to the brink of glory, as they moved 10 points ahead of second-placed Arsenal. And now, even if they do not wrap it up in these next two games, surely nothing can stop Mourinho winning the title in his second season after coming back to Stamford Bridge. As for United, this defeat may have ended their recent winning streak but they once again produced compelling evidence that they are now a very different proposition from the side that struggled, even though they were grinding out results, earlier this season. 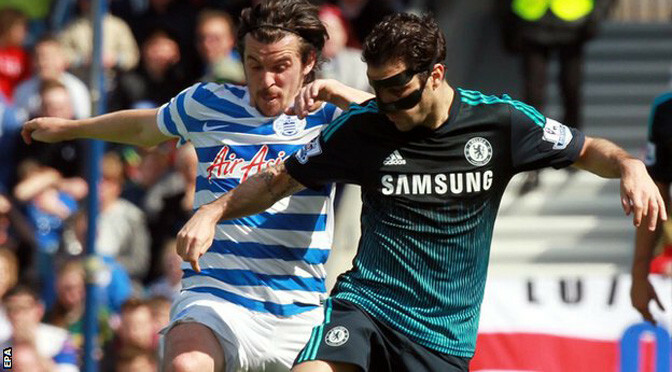 Cesc Fabregas struck with three minutes to go as leaders Chelsea ground out a win against QPR at Loftus Road. The midfielder arrived late into the box and fired home from 16 yards after Eden Hazard and Oscar capitalised on a poor kick out by QPR’s Rob Green. Chelsea had not registered a single shot on target until then but did enough to extend their lead at the top of the Premier League to seven points. QPR forced saves from Thibaut Courtois but remain two points adrift of safety. It would not have been undeserved if Chris Ramsey’s side had taken all three points – Belgian keeper Courtois denying Charlie Austin and the impressive Matt Phillips twice. Chelsea’s pass completion in this game was 70%, their lowest in a Premier League game this season, and the leaders struggled to deal with some intense Rangers pressing – midfielder Joey Barton catching the eye as he drove the hosts forward at every opportunity. Chelsea moved six points clear at the top of the Premier League after drawing with Southampton in what was a superb contest at Stamford Bridge. Diego Costa gave Chelsea the lead with a header before Dusan Tasic equalised from the spot after Nemanja Matic had fouled forward Sadio Mane. 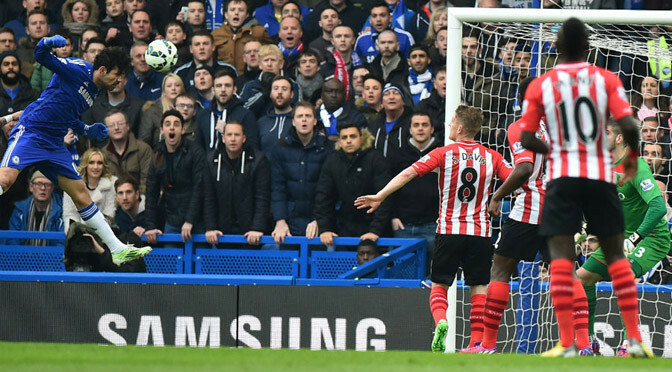 Southampton keeper Fraser Forster made a series of great saves to deny Oscar and Eden Hazard. 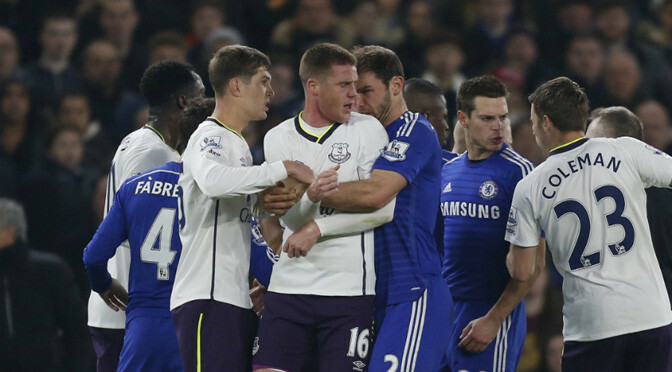 In the closing moments he made a point-blank block from substitute Loic Remy. Chelsea still have a game in hand on second-placed Manchester City, while Southampton moved above Tottenham into sixth, ahead of the Londoners’ later game against Manchester United. The Blues remain the likely league champions, but they cannot afford too many repeats of what was a very poor first-half display on Sunday. It began well for the home side when the unmarked Costa, who had not scored since January, got on the end of a delightful Ivanovic ball to head in his 18th of the campaign. However, Southampton were level eight minutes later. Mane, who was a constant menace for centre-backs Gary Cahill and John Terry, found himself sandwiched by Ivanovic and Matic in the penalty area. Referee Mike Dean awarded a penalty and showed an incensed Matic a yellow card. Tadic was left to despatch the spot-kick. The Serb was close to adding a second when his angled drive was brilliantly saved by Thibaut Courtois. The Belgian keeper then came to his side’s rescue again when his one-handed stop kept out Toby Alderweireld’s free-kick. Chelsea did have a shout for a penalty at 1-1 when Ivanovic’s heel appeared to be clipped by Tadic, but the referee waved away the player’s appeal. Jose Mourinho’s side needed some inspiration and whatever he said at half-time appeared to do the trick. The Portuguese brought on Ramires to replace Matic, which gave Chelsea more pace and industry in midfield. They suddenly looked a different proposition. If only they had not come up against Forster, who was in sparkling form. The Southampton stopper staked a very strong claim for the England number one jersey with blocks to twice deny Oscar, Eden Hazard and Cesar Azpilicueta, who was agonisingly close to scoring his first league goal for the club. Taking the second-half chances into account, Mourinho will rue his side failing to grab all three points, but on reflection a point each was probably a fair result. Chelsea followed up their Capital One Cup victory with a hard-fought 1-0 win on their return to Premier League business at West Ham. Jose Mourinho won a first trophy of his second spell as Blues boss with a 2-0 win over Tottenham on Sunday and Chelsea remain well placed to add a first Premier League title in five years. The Hammers had one win in 17 against the Blues entering the contest but refused to be cowed by the leaders and deserved more, only for Eden Hazard’s first-half header to settle the contest, keeping Chelsea five points clear of second-placed Manchester City. Mourinho spoke of short celebrations after the Wembley win and captain John Terry insisted they had been postponed until the end of the season, when he hoped there would be further cause to party. Yet at times it appeared as though Chelsea’s defenders had a hangover as the pace of Enner Valencia, Diafra Sakho and Stewart Downing found holes. Terry was booked for pulling down Valencia in the first half and cautious thereafter, with Chelsea indebted to a number of fine saves from the restored Thibaut Courtois – namely from Cheikhou Kouyate and Sakho – as the Hammers pressed forwards. Ramires struck a post on the counter-attack and had a header well saved by Adrian, while Willian spurned a late chance for a second to settle the contest. The Hammers now have one win in 11 league games to slip further down the standings – and Sam Allardyce appears to be running out of time to convince his bosses to extend his contract, which expires at the end of the season. Chelsea’s players, meanwhile, have two days off before resuming preparations for next week’s Champions League last-16 second leg with Paris St Germain. John Terry and Diego Costa did the damage – both with the aid of deflections – either side of the interval as Spurs’ hopes of repeating their success over Chelsea in this competition seven years ago never got off the ground. Despite a career laden with trophies, Mourinho claimed this was the most important final of his time in the game and Chelsea were never seriously troubled once Christian Eriksen’s early free-kick rebounded to safety off the woodwork. Mourinho’s mastery of the big selection decision was also demonstrated once more by his deployment of Kurt Zouma, a central defender by trade, in midfield to fulfil the role left behind by the suspended Nemanja Maticto outstanding effect. Spurs, for all their endeavour, never looked close to repeating that convincing victory over Chelsea on New Year’s Day, when Mourinho’s side were beaten 5-3 at White Hart Lane. And with Chelsea’s closest Premier League title rivals Manchester City losing 2-1 at Liverpool even before this final kicked off – leaving his side with a five-point advantage with a game in hand – this just about added up to Mourinho’s perfect day. Tottenham had the exertions of a Europa League tie – and painful exit – against Fiorentina in Italy on Thursday, and while this may have taken its toll, they never looked like rescuing the situation once Chelsea took the lead right on half-time. Tottenham’s usual suspects created early optimism for their fans as Eriksen bounced a 20-yard free-kick off the bar, although Petr Cech – preferred in goal to Thibaut Courtois – looked to have the situation under control, and Harry Kane ended a fine run with a low shot that was comfortably saved by Chelsea’s keeper. Willian’s free-kick was deflected out of a cluster of bodies to the feet of Terry, whose shot took a crucial touch off Kane to defeat Hugo Lloris, who was given the nod by Spurs boss Mauricio Pochettino ahead of regular League Cup choice Michel Vorm. 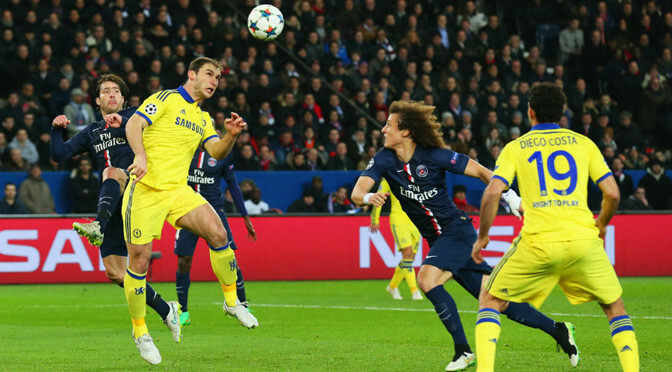 Stubborn resistance and a Branislav Ivanovic header earned Chelsea a 1-1 draw in the Champions League last-16 first leg with Paris St Germain at Parc des Princes. Jose Mourinho’s men are well placed to advance to the quarter-finals after Ivanovic netted a vital away goal, although Edinson Cavani equalised and PSG showed enough for Chelsea to be wary in the second leg on March 11. Chelsea advanced to the semi-finals at PSG’s expense last term on away goals after losing 3-1 in Paris and Demba Ba’s last-gasp strike in the return in London. The Blues had won just once in six prior attempts on French soil, at PSG in Mourinho’s first European match as boss in September 2004. With striker Diego Costa restored following his disputed three-match ban for stamping on Liverpool’s Emre Can and returns for goalkeeper Thibaut Courtois, defender Gary Cahill and playmaker Cesc Fabregas, Chelsea were at full strength against an injury-depleted PSG, who started with former Chelsea defender David Luiz in midfield. Luiz stated on the eve of the match that Chelsea were a better team than last season and they fared better than on their last trip to Paris. Chelsea’s bus became stuck entering the stadium and Zlatan Ibrahimovic caused the visitors all kinds of difficulties once the match began. Courtois made three saves from headers in the first half, the pick from Cavani, before Ivanovic’s header against the run of play. Cavani equalised after losing Cahill to meet Blaise Matuidi’s cross and both the Uruguay striker and Ibrahimovic had chances to double PSG’s lead. 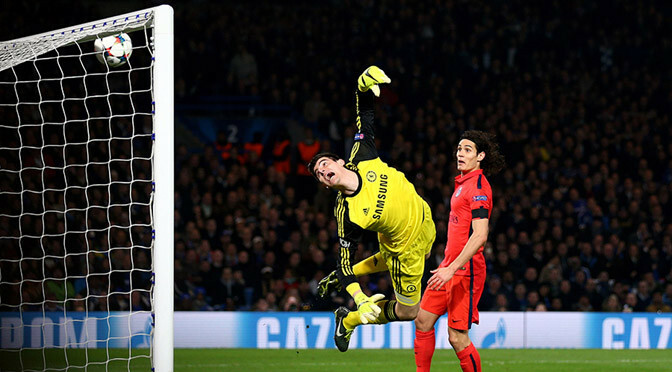 The Swede was denied by Courtois in stoppage time to leave Chelsea in control of the tie heading to Stamford Bridge. There are three weeks and a day before the return, by which time Chelsea’s confidence may be boosted by silverware, with the Capital One Cup final against Tottenham on March 1.